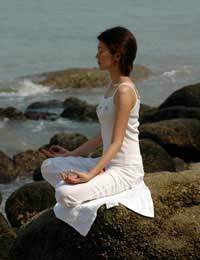 Those wishing to refresh themselves beyond what can be achieved with regular meditation may wish to get away from it all and calm the soul with a meditation retreat at an Ashram or at some other dedicated centre for relaxation – such as a health spa, or merely on an organised holiday dedicated to meditation. Meditation retreats are becoming increasingly popular and necessary in today’s hectic society. Choosing a retreat may be a daunting prospect. You may wish to begin by asking friends and associates if they know of any recommended retreats. If you have a meditation or yoga teacher it may well be that they can help you to find an appropriate retreat – many teachers run yearly retreats themselves: A great way to get to know your class better! Every so often stress builds up in our bodies to such a degree that we need to get away from it all. The old adage ‘A change is as good as a rest,’ is a sensible one, but sometimes we really do need a change and a rest! A meditation retreat is an ideal way of combining a holiday with deep relaxation. Remember that rest is one of the most often prescribed cures for stress and can also act to pre-empt and avoid unnecessary stress altogether. Why wait until you are on the verge of breakdown, when you can benefit from a retreat right now? A retreat can be as simple as you wish to make it, and you needn’t join a pre-organised meditation excursion if you wish to save money, or go it alone. Certainly, meeting with other like minded people may be enjoyable and helpful, but be sure to consider other options: Retreats are often charged at extortionate costs, when it may just as well be possible to jump in a car or on a train and head to some sleepy backwater where you can find all the peace you want on a shoestring! The main thing is to choose somewhere where you can relax and feel safe. Facilities such as a swimming pool, sauna and spa will be a bonus, as will a quiet beach and some open spaces such as fields. Sights of spiritual significance may also help you to focus your meditation. If you do wish to tailor your own retreat it may well be worth heading somewhere cheap and warm off season – such as Madeira or Tenerife. Once you have chosen your retreat (with others, or alone, as a planned meditation retreat, or on a meditation holiday of your choosing) and got there, let everything from back home slip away, and feel the burden being lifted from you. This should be an opportunity to really let go of all that ‘baggage’. Don’t check your e-mail, put your phone on silent, and tell people not to call you whilst you are away. Make this like meditation times ten! Your aim will be to completely relax and forget the false worries that discolour your life. You will soon realise how unnecessary these worries are, and feel invigorated when you return home to your usual routine.